Gives your dishes a full, meaty taste. Knorr Pork Broth is also perfect for stews. Iodized Salt, Enhancer (Monosodium Glutamate E621), Palm Oil And Fat, Corn-starch, Sugar, Pork Flavour (Nature-Identical, Contains Egg And Whey Powder), Pork Lard, Onion Powder (Contains Sulfite < 50Ppm), Pork Meat (1.36%), Enhancer (Disodium Ribonucleotide E635), Yeast Extract, Pepper Powder, Butter Flavour (Natural, Contains Milk), Garlic Powder (Contains Sulfite < 171Ppm), Caramel Paste E150D. Made with carefully selected quality pork meat, fat and Flavours, in an easy-to-use paste format. It gives your dishes a rounded taste, full-body Flavour, and pork aroma - a perfect base for your pork-based stock, soupy dishes and stews. 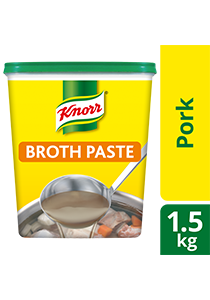 For a full-flavoured pork broth, dilute 22g of Knorr Pork Broth Base per 1 liter of water.